This picturesque waterfront marketplace and marina has something for everyone. There is a full service marina that has over 100 large slips and a state-of-the-art fuel dock that is open 18 hrs. a day. From the marina you can find water sports and tour operators, fishing vessels, the Dolphin Experience and even a trip on a semi submarine. There are so many different options you will have a difficult time choosing what to do! 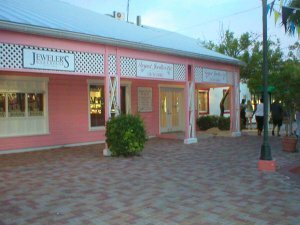 There is everything and anything you can think of from fine gems and jewelry to the local straw markets where you can watch some of the local craftsmen produce these wonderful souvenirs. 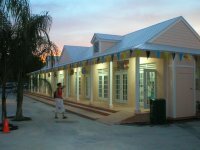 Shopping at Port Lucaya offers world-wide imports and many duty free bargains. Read info and details on duty. You can choose from a romantic dinner or a quick snack. Pick one of the many international restaurants like Greek, Italian or try something a bit different in one of our Bahamian restaurants. Some of the fine dining features waterfront or water view tables and ambiance. Others include views of the live entertainment in Count Basie Square. We have fast food (unfortunately) and US chains as well as gourmet dishes and Bahamian food that will help you experience the full flavour of our island. There is live music and on some nights native shows in the Count Basie Square, our native entertainment complex. 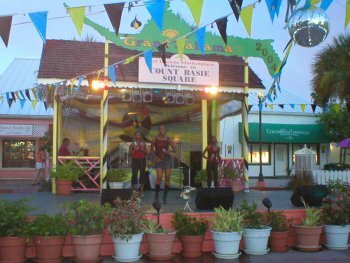 Sit back with a cool tropical drink, enjoy the music and dancing, you can even join in and learn the local dance steps or a familiar one such as the Electric Slide. As a grand final watch as the limbo artists amaze you with there flexibility and balance. All this and more can be yours at the Port Lucaya Marketplace & Marina.